Middle class residents of major American and Canadian cities tend to have their favorite all-day Sunday brunch haunts&ellipsis;relaxed, clean, diner-style restaurants dishing up home cooking in a comfortable familiar environment. Six days a week from 1 to 6 pm Los Almendros serves such a function for local Oaxacans. Tucked away on a cobblestone privada close to Blvd. Manuel Ruiz in Colonia Reforma, a few blocks northeast of the baseball stadium, Lionel Leyva with wife Soledad and family have been greeting friends and new devotees since 1974. You can’t help but feel at home in this Cheers-esque setting as you watch Lionel grgreet his own set of Frazier Cranes. Upon entering the quadrangle-shaped comedor you’re struck by its warmth and amiability, without a trace of pretension. Wooden tables with traditional colorful woven cloths are covered with thick plastic. Walls are adorned with framed photos of the owners with family and patrons of celebrity&ellipsis;no politicians, but rather actors, singers and songwriters. Two mounted deer busts serve as testimony that the Leyvas do things their way, and the throngs of faithful as evidence of approval. The menu is limited to perhaps 15 or 20 authentic Oaxacan plates, some of which are appetizers. You can choose daily specials not often found in other local eateries. All is á la carte, so begin with one or two of the modestly priced botanas, perhaps memelas or an appetizer sized grilled meat dish, each of which is accompanied by salsa and guacamole. The house mezcal is noteworthy and definitely worth sampling if nothing else. For this visit Lionel had a tobalá and a surprisingly smooth gusano. Although we arrived relatively early for this comida, by the time we were ready to order entrée;es, surprisingly the Sunday staple of Barbacoa de Borrego (bbq goat) had been sold out to patrons who knew better than we did to order ahead or for take-out. All was not lost, however, since my wife’s main dish of tender pork ribs was prepared in the same style as one of the traditional barbeque recipes, baked in a tangy sauce and enveloped in foil. Try the black beans with aromatic flavor of hierba de conejo as a side dish to any of the grilled or baked meats. I began with a generous, piping hot serving of absolutely spectacular caldo de espinazo with an assortment of carrots, beans, potatoes and requisite pork, flavored with chili pasillo and accompanied by a dish of sliced lime, chopped onion and serrano chili for added acidity, spice and texture. That, after appetizers and some of the better tortillas I’ve had in a while should have been enough, but the tongue in its traditional mole called out to me. With whole black and green olives, and a tomato based sauce flavored with onion, garlic, raisin and almond, this bowl of lean, succulent sliced meat ranked with the best. To complete the meal, if you haven’t had cajeta, the goat’s milk caramelized sweet, try it here in a light gelatin, alongside a cup of café de olla. Just as the regulars returned to that immortalized Boston bistro every week, you too will be drawn back to Los Almendros time and again, if not on a subsequent visit during this trip to Oaxaca, then upon your return&ellipsis; and greeted just as warmly as the old gang. 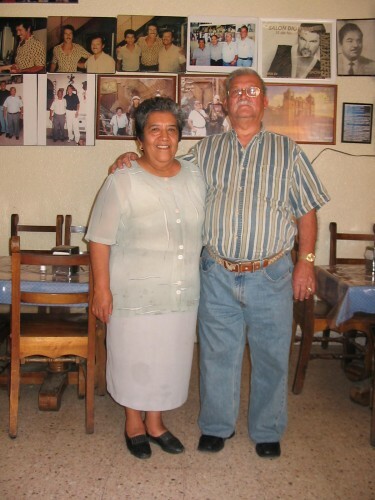 Alvin Starkman and wife Arlene are residents of Oaxaca, operating Casa Machaya Oaxaca Bed & Breakfast. They will provide a positive review only after a minimum of 3 consecutive good dining experiences. This page has been visited times since May 8, 2006.